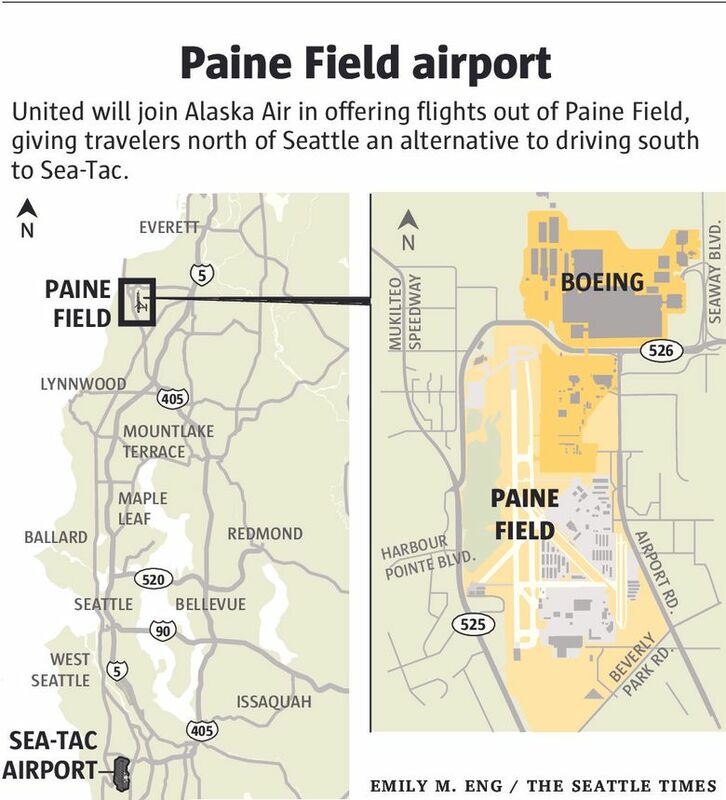 United announced it will join Alaska Air in operating passenger service from Paine Field in Everett. United Airlines plans to begin commercial passenger service from Paine Field airport in Everett in fall 2018 with six daily flights to its hubs in Denver and San Francisco, the airline is announcing Thursday. United follows Alaska Air Group in committing to scheduled flights out of the Snohomish County airport, ensuring that the planned passenger terminal will operate almost at full capacity as soon as it opens next year. The airport will offer air travelers north of Seattle an alternative to Seattle-Tacoma International Airport when flying to some popular Western U.S. destinations. United offers connecting flights to about 120 destinations from those two cities. In May, Alaska Air Group said it will begin passenger service, also in fall 2018, with tickets going on sale early next year for nine daily departures to destinations along the West Coast from Oregon to California. The planned services by Alaska and United combined should almost fully occupy the two airport gates planned at the new terminal. 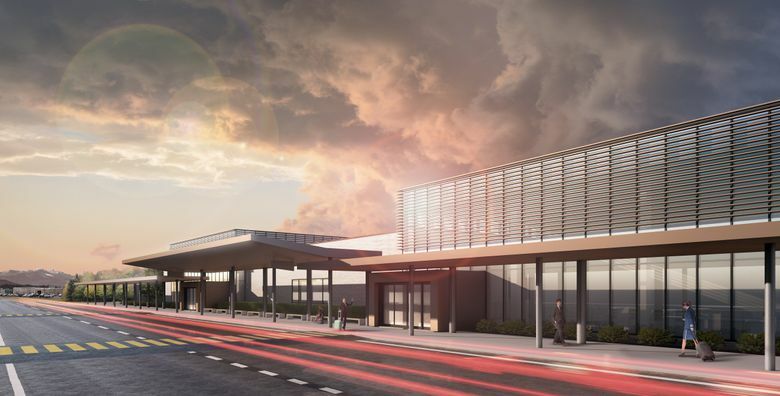 Propeller Airports, which is owned by New York-based private equity firm Propeller Investments, is developing and will operate the terminal, which had its groundbreaking in June. With typical turn times, the terminal’s two gates mean a peak capacity of roughly 16 passenger flights per day, or 32 takeoffs and landings. Paine Field, named in honor of hometown hero Topliff Olin Paine, an Army Air Corps pilot during World War I, was constructed during the Great Depression to create jobs and economic growth in the region by the Works Progress Administration (WPA) in 1936, eight years before Seattle-Tacoma International Airport. In 1939, United operated the first commercial airplane flight out of the airport, a courtesy flight carrying Snohomish County commissioners and members of the media. In those early days, Boeing Field in Seattle was the main regional airport. Paine Field initially served as an alternate landing site on days when weather prevented commercial flights from landing in Seattle, as well as a hub for small private airplanes. After Boeing in 1966 chose Paine Field as the location for building its first widebody airplane, the 747 jumbo jet, the site became a major center of Boeing production and today produces the 747, 767, 777, and 787 jets. According to data provided by Paine Field, airport traffic in 2016 included an average of 7.6 takeoffs or landings per day by newly rolled out Boeing aircraft or by the Dreamlifter jets that bring in large pieces of the 787 Dreamliner. Last year, the airport also saw an average of three takeoffs or landings per day by other big jets, mostly those undergoing maintenance at the ATS aircraft repair and modification facility. However, 96 percent of the flight operations out of Paine Field today are by small private aircraft. Paine Field is known as a regional tourist attraction because it’s the site of Boeing’s widebody-jet plant tour, the Future of Flight exhibition center and two big collections of historic airplanes. Bill Dolan, deputy director at the airport, said the arrival of passenger service will make the airport more widely known to travelers. Citing noise and traffic concerns, nearby residents in the city of Mukilteo, which adjoins the Paine Field runway, long opposed commercial flights at the airfield. However, local elected officials in Everett and Snohomish County and as well as officials at the Federal Aviation Administration (FAA) fully backed the project. Mukilteo Mayor Jennifer Gregerson told the Seattle Times in May that Propeller has agreed to limit the number of commercial flights to a maximum of 22 per day and to restrict commercial air operations to the hours from 7 a.m. to 6 p.m.
On Thursday, she conceded this was not the case — there is no such agreement with Propeller. Instead, she said it’s the Snohomish County permitting process and environmental impact analysis that imposes limits on the hours of operation and number of flights. However, the document Gregerson cited, the county’s “Mitigated Determination of Nonsignificance,” does not impose such limits. To assess the environmental impact, that document estimates the maximum number of daily passenger flights at 16 (or 32 take-offs and landings), based on the logistics of operating only two gates. But that number is not a limit. Deputy airport director Dolan said that Propeller would need further permission to construct additional gates, but if they instead worked out a way to have faster turnaround and higher throughput of airplanes at the initial two gates that would not trigger additional review unless it was deemed to add a “substantial” new negative impact. In addition, nighttime flights are not prohibited. Instead, the county’s environmental review asks Propeller to seek voluntary agreements with the airlines using the airport to limit their nighttime flights (after 10:00 p.m.) to “no more than four” in any 24 hour period. Information in this article, originally published on the morning of August 10, 2017 was corrected later that morning. A previous version of this story, using information provided by Mukilteo Mayor Jennifer Gregerson, incorrectly stated that Propeller had agreed to limit the number of flights and hours of operation at Paine Field.